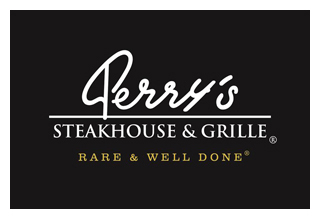 May is Mental Health Month and Perry’s Steakhouse & Grille in Oak Brook (5 Oakbrook Center, Oak Brook, IL 60523; 630-571-1808) along with Staglin Family Vineyard are helping to raise awareness by donating proceeds from the sale of Staglin’s SALUS wines beginning May 11 through June 30, 2018. Staglin will donate their proceeds to benefit mental and brain health research, giving you even more reason to enjoy these exquisite wines by the glass. 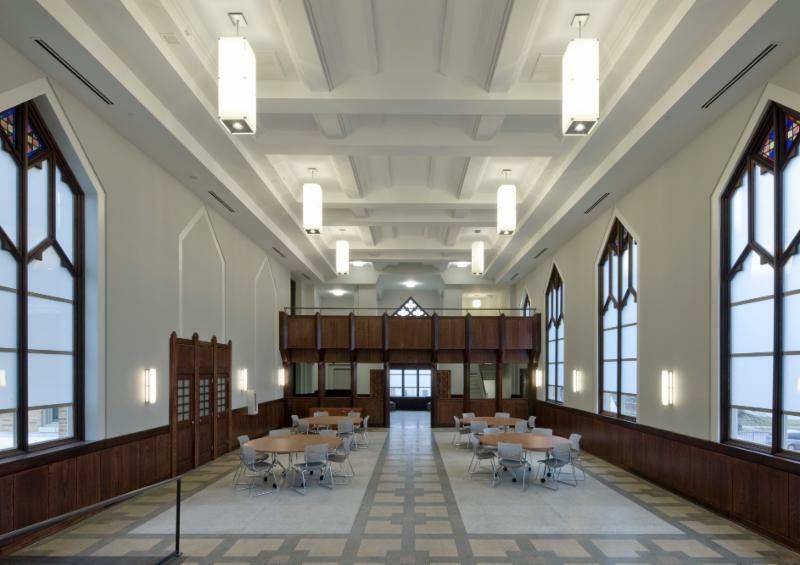 Join us for a panel discussion, tour and reception at the Aurora St. Charles Senior Living facility in Aurora (pictured above), a 2017 Landmarks Illinois Richard H. Driehaus Foundation Preservation Award-winning project! Representatives from three LI 2017 award-winning preservation projects, the Landmarks Illinois Richard H. Driehaus Foundation Preservation Awards, will discuss the challenges of reusing and restoring historic buildings. Panel participants are: David Block, Evergreen Real Estate Group - Aurora St. Charles Senior Living; Diana Shott, Resource Bank - Resource Bank, Sycamore; and John Phelps, Turner School LLC - District 2 Police Station (formerly Turner School), Rockford. The panel will be moderated by Lisa DiChiera, Landmarks Illinois Director of Advocacy. The event also includes a tour of Aurora St. Charles Senior Living, a 60-unit senior housing complex housed in the former St. Charles Hospital, a historic, six-story Art Deco building. ADMISSION IS FREE, BUT PLEASE RSVP! The Department of Cultural Affairs and Special Events (DCASE) is pleased to announce the lineup for Millennium Park Summer Film Series happening Tuesdays, June 5 through August 21, at 6:30pm. New this year, each screening in the series will be programmed in collaboration with a local independent film festival providing a season-long sampling of the themes, ethnicities and genres seen in the more than 50 film festivals presented annually in Chicago. Highlights of this year’s line-up include: Hairspray in collaboration with the Chicago Underground Film Festival on June 5-opening night, Groundhog Day in collaboration with the Chicago Comedy Film Festival and Second City on June 26, High Fidelity in collaboration with the Midwest Independent Film Festival on July 3, Man on Wire in collaboration with the Chicago Media Project’s DOC10 Film Festival on July 10, the U.S. premiere of the International Media Mixer produced by the Chicago Film Archive on July 17, Get Out in collaboration with the Gene Siskel Film Center’s Black Harvest Film Festival on July 24, a double feature of WALL-E and Crash in collaboration with the One Earth Film Festival and Peace on Earth Film Festival on July 31, Slumdog Millionaire in collaboration with the Chicago International Film Festival on August 21 and many more! There will also be a special day-time, family-friendly screening of Iron Giant in collaboration with the Facet’s Chicago International Children's Film Festival on Monday, July 9, at 11 a.m.
Additionally, each film presentation will begin with a screening of a “ChicagoMade Short” – a locally-produced short film. A program of the Chicago Film Office’s Independent Filmmaker Initiative, the ChicagoMade Shorts Series is a celebration of the robust local independent film community and a showcase of entertaining work produced by talented Chicago-based artists. Directed by John Waters and starring Ricki Lake, Divine, Debbie Harry, Sonny Bono and Jerry Stiller, this cult film classic follows teenager Tracy Turnblad (Ricki Lake) as she pursues stardom on the local television hit the Corny Collins Dance Show and rallies against racial segregation. In a post-apocalyptic desert wasteland where people must fight for scarce resources, a woman (Charlize Theron) rebels against the tyrannical ruler in a search for her homeland with the help of a group of female prisoners, a psychotic worshipper and a drifter named Max (Tom Hardy). In order to save his family’s struggling shoe business, straight-laced Charles Price (Joel Edgerton) teams up with Lola (Chiwetel Ejiofor), a flamboyant cabaret singer, with an unorthodox idea to produce custom footwear for drag queens. Cynical and frustrated news reporter Phil Connors (Bill Murrays) finds himself reliving the same day covering the annual Groundhog Day festivities in small town Punxsutawney, Pennsylvania, with his cameraman Larry (Chris Elliott) and producer Rita (Andie MacDowell). Just as Phil starts to believe the he is doomed to live this day for all eternity, he learns that life isn’t what happens but how you react to it. Thirty-something Rob Gordon (John Cusack), a former club DJ and now owner of record store Championship Vinyl, with a penchant for compiling top five lists, attempts to understand why he has been dumped by his latest girlfriend Laura (Iben Hjejle) by revisiting his life’s top five worst break-ups. Much of the movie, based on the book by Nick Hornby, was filmed in Chicago. As the summer season kicks off in Millennium Park, some important changes are coming to improve security and the visitor experience at the park. The City of Chicago will implement a security perimeter and bag check for all concerts and events that take place in Millennium Park. Outside alcohol will be prohibited at the seven Jay Pritzker Pavilion events with the highest attendance; however, food and other beverages are still permitted: May 26: Chicago House Music Festival; June 8–10: Chicago Blues Festival; June 24: Chicago Mariachi Festival; July 4: Grant Park Music Festival Independence Day Salute; August 9: Wait, Wait Don’t Tell Me; August 13: Broadway in Chicago Summer Concert and August 29–September 2: Chicago Jazz Festival. Outside food and beverage, including alcohol, will be permitted at the Millennium Park Film Series and among over 70 public concerts and programs happening in Millennium Park this summer. Opened in 2004, Millennium Park is a 24.5-acre urban park in the heart of downtown Chicago, home to the iconic Cloud Gate sculpture (also known as “The Bean”) by Anish Kapoor, Crown Fountain designed by Jaume Plensa, the Frank Gehry-designed Jay Pritzker Pavilion, Lurie Garden and more. Millennium Park is Chicago’s town square and the anchor of an urban cultural campus that includes the Chicago Cultural Center, Maggie Daley Park and the Art Institute of Chicago—all connected by the Chicago Cultural Mile. Millennium Park is located on Michigan Avenue, bordered by Randolph St. to the north, Columbus Dr. to the east and Monroe St. to the south. The Park is open 6am–11pm daily. For the latest news and events, download the Millennium Park app, visit millenniumpark.org, like us on Facebook and follow us on Twitter and Instagram, @Millennium_Park. 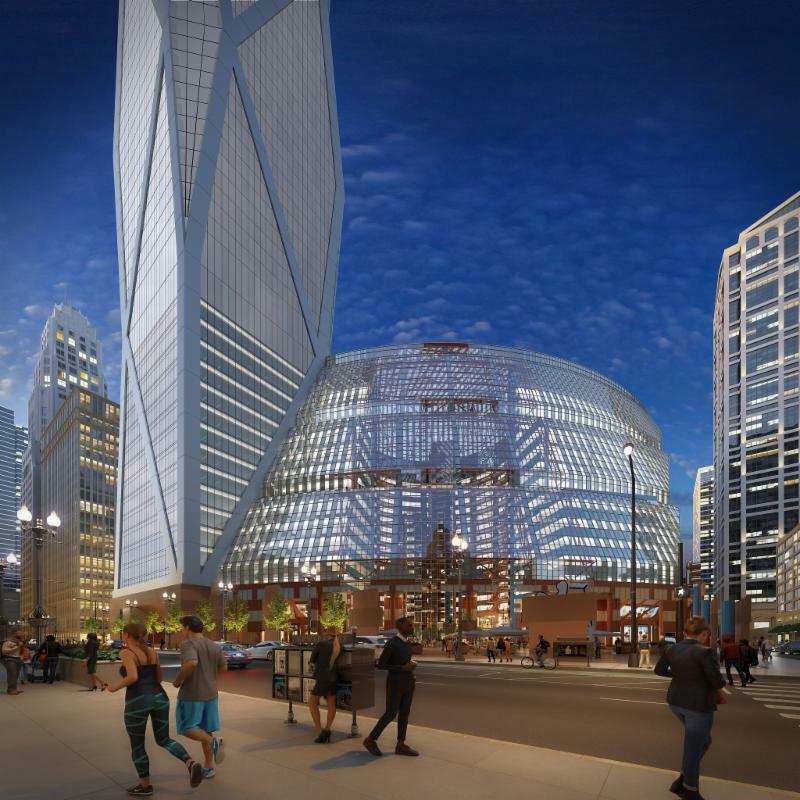 A rendering showing the Thompson Center in Chicago reimagined as a mixed-use destination. As part of its inclusion on the 2018 Most Endangered list, LI released renderings that show the Thompson Center restored and reused. Landmarks Illinois President & CEO Bonnie McDonald will discuss LI's 2018 Most Endangered Historic Places in Illinois, which LI announced on April 25. The historic sites included on this year's list are those threatened by deterioration, lack of maintenance, insufficient funds, and in some cases, need new ownership. Join us during Preservation Month to learn about the threats and possible solutions for some of the Chicagoland sites that made the list. The lecture will also discuss LI's newly released renderings (pictured above) that show a possible way to restore and reuse the James R. Thompson Center in Chicago, included on the 2018 Most Endangered Historic Places in Illinois. The cocktail fundraiser will be held on Tuesday, May 29th from 6pm-9pm at Gene & Georgetti Steakhouse (300 N. Franklin Street). 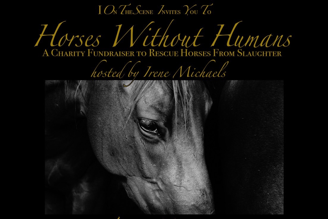 Horses without Humans is a non-profit organization that rescues horses from slaughter, giving them proper health care, rehabilitation, training and love to prepare them for adoption and a second chance at life. If you are unable to make, but would like to make a donation to the charity, you can contribute via the fundraiser’s GoFundMe page. Irene Michaels is the founder of I On The Scene – a culture, fashion and beauty site that publishes exciting content on the biggest entertainment news in Chicago, New York, and Los Angeles and overseas. In addition to her work with I On, Irene is an award-winning equestrian and can often be found at the stables.